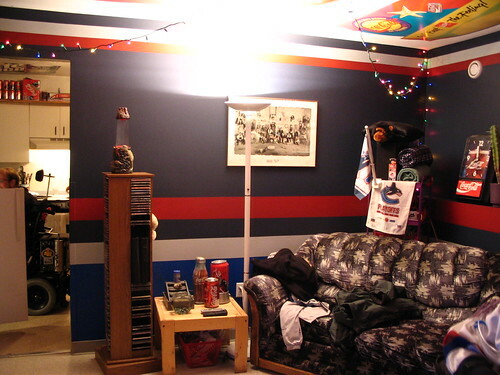 If you have a sports team that you are particularly devoted to, my friend Dale Hampshire has a good idea for you: profess your loyalty by painting your room according to their jersey stripes. He did it for the Vancouver Canucks, and the effect is surprisingly good. You can tell instantly that this is a "Vancouver Canucks" room. Try it for your favorite team! posted by Jonathan at 11/27/2005 12:10:00 a.m.
And for a hockey team too! Though it would be more surprising if someone in this area did it. By Floozle, at 11/27/2005 8:49 a.m.
Hi Floozle - I'll pass on your comment to Dale. He'll be delighted! By Jonathan, at 11/27/2005 9:16 a.m.